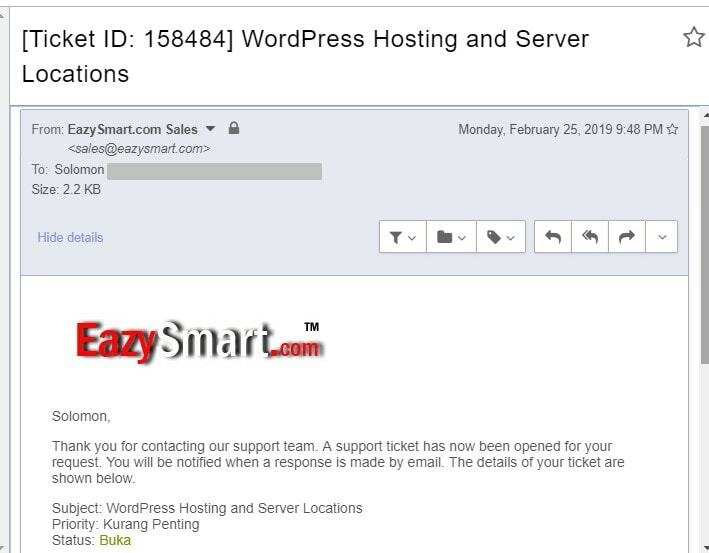 EazySmart Review 2019: Is EazySmart a Good Hosting? EazySmart is an Indonesia-based hosting company established in 2007. It markets itself as an affordable web hosting firm for SMEs in Indonesia. EazySmart was founded in 2007 in Indonesia as a web hosting company. The company’s servers are hosted in data centers located in the U.S. and Indonesia. The vendor focuses on the provisioning of shared hosting, cloud hosting, and VPS solutions. It also offers web design solutions. The EazySmart website is only available in Indonesian. EazySmart data centers are connected to a 1Gbps network. Its servers use CloudFlare CDN to improve the speed with which its clients’ websites load. What’s more, the vendor claims to have put in place reliable spare part management systems to ensure that it delivers excellent hosting solutions to its customers in Indonesia and beyond. EazySmart incorporates caching technology that saves a user’s frequently visited webpages as a way of improving the loading speed. What’s more, the vendor allows users to adjust the server resources they are using based on the changes taking place in your business; you can easily and instantly add CPU and RAM to accommodate an increase in traffic that you are anticipating. As part of its redundancy protocols, this hosting provider stores its customers’ website data in three different servers. In addition, it uses automatic failover technology to detect server failures and automatically transfer your website to another server, an effective way to avoid downtime. EazySmart says that its hosting platform uses remote backup technology to offer data security to its clients’ websites. The vendor does not explain further how these remote backups are performed or how often they happen. EazySmart hosting solutions are reasonably priced. The vendor offers flexible billing cycles where customers commit to a monthly or annual payment plan. The hosting prices are listed in Indonesian rupiah. EazySmart has a 30-day money-back guarantee. It also offers a 99.9% network uptime guarantee. Clients can contact the EazySmart technical support team using their telephone, ticketing system, or live chat. The vendor has not made available a support email on its website. EazySmart’s technical support team is available 24/7. Nevertheless, this team did not respond to a ticket I opened asking for information about some of its hosting solutions and data centers. I only received an automated response with my ticket number and the URL via which I can monitor the responses I receive under that ticket. The vendor then went ahead and closed my ticket without acknowledging it or addressing any of my queries. The knowledge base on this vendor’s website is quite limited as well. EazySmart strikes an interesting balance between investing in modern hosting hardware and technologies, and offering cheap prices for its customers in Indonesia and beyond. But given that they have been operational for over a decade, its slightly over 3,000 clients seems a little low. Perhaps its unresponsive support team has something to do with these low numbers. Wondering how EazySmart stacks up against other Web Hosting companies? Enter any other Web Hosting company and we will give you a side-by-side comparison.